A-HOTEL.com - Luxury and cheap accommodation in Kosa Chushka, Russia. Prices and hotel, apartment booking in Kosa Chushka and surrounding. Guest House Marina features a seasonal outdoor swimming pool, garden, a terrace and shared lounge in Il'ich. All rooms boast a flat-screen TV with satellite channels and a private bathroom. Guest House Elena offers air-conditioned rooms in Il'ich. Featuring a 24-hour front desk, this property also provides guests with a children's playground. Located in Il'ich, Edem Guest House features accommodation with free WiFi and a kitchen. All units feature air conditioning and a flat-screen TV. Boasting a seasonal outdoor swimming pool and BBQ facilities, as well as a restaurant, Suhie Vesla Guest House is situated in Il'ich. The property features a terrace, as well as a bar. Guest House on Lenina is offering accommodation in Il'ich. Among the various facilities of this property are barbecue facilities and a terrace. Fortuna Guest House in Il'ich has a seasonal outdoor swimming pool and barbecue facilities. The guest house also provides free WiFi as well as a paid airport shuttle service. Located on the beachfront in Il'ich, Guest House U Morya has a private beach area. Featuring a shared kitchen, this property also has a restaurant and a terrace. Set in Il'ich, Hotel Sem Vietrov provides a terrace and free WiFi. All rooms boast a flat-screen TV with cable channels and a private bathroom. 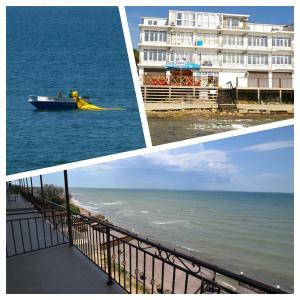 Featuring a beachfront on the Sea of Azov in Taman, Hotel Fortuna features an on-site restaurant and bar serving European cuisine. The Crimea bridge is 5 km away. Offering a garden and free WiFi, Old City Hotel is a self-catering accommodation situated at the Black Sea coast in Taman. The rooms come with air conditioning, a terrace, hairdryer and flat-screen TV with satellite channels. Guest House Na Oktyabrskoy 33 offers renovated accommodation in Taman. Free private parking is available on site. Диканька is located in Taman. Every unit has a private bathroom and bath, air conditioning, a flat-screen TV and a fridge. Set in Taman, Hotel Blanko features a shared lounge and bar. Among the facilities of this property are a restaurant, a 24-hour front desk and valet parking, along with free WiFi. Featuring free WiFi, Guest House on Fanagoriyskaya 53 is located in Taman. Staff on site can arrange airport transfers. Бора-Бора is set in Taman. This apartment provides accommodation with free WiFi. Мини-гостиница is offering accommodation in Taman. The accommodation provides a 24-hour front desk as well as free WiFi. У Екатерины is set in Taman. Among the various facilities of this property are barbecue facilities and a garden. Апартаменты в деревне is situated in Zaporozhskaya and offers barbecue facilities. The air-conditioned accommodation is 43 km from Taman. Boasting a seasonal outdoor swimming pool and a garden, Vinogradnaya Loza is set in Primorskiy. Both private parking and free WiFi are available on site. Komnaty is situated in Tamanskiy. Free WiFi is available.